The tenth Talons Over Cordoba was a celebration of a decade of the finest flying and aircraft assembled from all over the world. Attracting over 450,000 visitors during the fortnight the Talons over Cordoba Contest has been another big success with a record breaking crowd. This year Talons was again held at the Cordoba Air Base to limit disruption at the airport. Most of the resident unit, Aerea Regimenta No1, has moved to Mercedes Air Base but two squadrons of I-02 Pulqui fighters remained. Once again this international event is a chance for the best pilots in the world to show off their skills allied with the best fighters available and it is now the world’s foremost fighter exhibition. Air forces from across the world fly and compete to be the best while showing off their latest fighters and comparing them against the best available elsewhere. The exhibition display area once again attracted many companies eager to make sales. FMA (Fabrica Militar de Aviones) had a large exhibition in one of the hangars with the four prototype I-02 and I-02-II fighters which flew demonstrations most days, four I.Ae 22 advanced trainers were also flown during the event and a production four-engined FMA I.Ae 7 airliner in Aeravias Argentinas S.A. colours that made several flypasts during the event. The I.Ae.20 El Boyero (The Herdsman) two-seat light cabin aircraft was also on display and made some breathtaking short take-off and landing displays. Chile has sent two flying examples of the latest Constellacion Condor: one of the Serie-400 with FMA radial engines, and one of the Serie-410 "African Condors" with the French Clerget diesel radial engines. Chile also showed off the latest ENAER N1E-3 Coati advanced trainer and a production Alicanto. Also on display was a small model of the future Zafiro trainer. France sent four Bloch MB.1050 Milans, four VG.60 Revenants, two Breguet Br.890 Épaulard dive bombers, two Latécoère Late-550 Épaulard torpedo bombers and a Lioré-et-Olivier LeO 400 floatplane. Some of these flew during the event as well. Also a pair of chartered Air France MB.970 Transatlantique airliners flew into Cordoba airport from Europe via Dakar and Brazil. They were available for tours during Talons. Nordmark had single examples of the Saab F-21 Mk 1 and Orkan Mk 4 fighters on display and the VL Puuska light fighter was flown. From America Grumman, Curtiss, Boeing and Bell all sent display items and flew several demonstrators. The usual German firms in attendance included Dornier, Heinkel, Junkers and Focke-Wulf. From Britain Supermarine were displaying two brand-new Spitfire Mk IVs. Hawker flew a display Typhoon and Tornado and had a scale model of the new Tempest as on show as well. Fairey brought a Firefly carrier fighter and made several excellent flying displays with it. From Atlantis both Spartan and Accrisius brought a dozen aircraft between them. As usual the best fighter pilots in the Fuerza Aerea Argentina made a spectacular aerial aerobatic display every day of the contest in their blue and white FMA I-02 Pulqui fighters. Japan sent a display team only this year. The Navy sending the 11. Air Demonstration Squadron "Blue Impulse" (a.k.a. "The Air Demonstration Squadron Formerly Known as Manzo's Flying Circus"). All contesting pilots have been assigned numbers in the order of application and nationality has not been a factor in the order given. No 1 Major de Aero Antonio Valdez, commander of Squadron 1/2 of the 1st Grupo of Aerea Regimenta No1 based at Cordoba [two confirmed kills in the South American War], he is flying his personal silver FMA I-02 Pulqui C/N1044 with a blue tail for the third time at Talons. No 2 Major de Aero Horatio Cisco, commander of Squadron 1/1 of the 1st Grupo Aerea Regimenta No 6 based at San Miguel de Tucuman makes his debut at Talons flying his personal all-black FMA I-02-II Pulqui C/N 1020 powered by a 1,500hp FMA-Spartan V-12 engine. No 3 Flt. Lt. Bob Stanford Tuck returns to Talons and he is flying a standard production Spitfire F.Mk.III EN780 powered by a 1,100hp RR Merlin IV V-12 engine. No 4 Flt. Lt. James Edgar "Johnnie" Johnson makes his debut to Talons flying Spitfire F.Mk.III EN791 powered by a 1,100hp RR Merlin IV V-12 engine. No 9 RCNAS Cmdr. Reginald Antilles of the 65th Fighter Group returns this year to represent Canada and he is flying a production Burnelli Aviation CF-38b twin-engined fighter powered by two 2,000hp Orenda Oneida II V-12 engines in standard RCNAS livery, named "Cannon Spike." No 10 RCNAS Cmdr Mark Stele of the 181st Fighter Group returns to represent Canada for the sixth time and is again flying the forty-sixth production Avro Canada CF-12 Viper fighter powered by a 1,750hp Orenda Oneida III V-12 in a pusher configuration, painted in standard 181st Fighter group livery (including red striping) and named "Doom On You." No 11 Comandante Gaspar Alencar of the Marinha Imperial debuts for Brazil and is the fighter squadron commander on board the aircraft carrier Brazil. He is flying his personal BL-01 Tufão (Typhoon) (Bloch M.B.1050 Milan) fighter, named Rodando Dançarino (Twirling Dancer), which for the competition is painted in Dark Blue and Medium Grey with the control surfaces stylised with the Brazilian Flag as well as a painting of a traditional Portuguese dancer in a green, yellow and blue dress on the nose. The recent death of the Brazilian king is honoured by black bands on the rear fuselage and wings of both BL-01 fighters. No 12 Capitão Manoel Santos, also of the Marinha Imperial is another debut for Brazil. He is the currently second in command of the Brazil's fighter squadron, but his transfer to the new aircraft carrier currently under refit in Greece as fighter group commander has been confirmed. He is flying a BL-01 Tufão with the same general paint scheme as Comandante Alencar's aircraft with a life-like painting of a young Brazilian woman wearing a very skimpy swimsuit in Brazilian national colours on the nose along with the text Coisa pequena minúscula (Tiny Little Thing). No 13 Captain Kamol Arthit is representing Thailand for the second time at Talons and the Navy pilot is flying a standard Italian Re-2001 fighter again. No 14 Major Amnuay Jainukul of the Royal Thai Air Force makes his debut appearance at Talons. He is currently assigned to the Thai Air Force's premier squadron and is the leader of the Air Force's demonstration team. He was one of the first pilots to convert to the Fw-190 and he is flying a standard Fw-190A in standard Thai markings while, the nose bears a traditional picture of a monkey in pink and gold. No 15 Oberleutnant Heinrich Bär returns to represent Germany from Jagdgeschwader 51, flying a Focke Wulf Fw-190A powered by a BMW 801 radial engine. No 16 Stabsfeldwebel Anton Hafner also returns to Talons and is also from Jagdgeschwader 51 and is flying an identical Focke Wulf Fw-190A. No 18 Lieutenant Djorde Popovic, also of No.62 Squadron is another newcomer to Talons and he too is flying a standard Soko Jastreb. No 19 Captain Andreas Schrieber returns this year to represent Denmark and is flying a white production DAF(s)4v3 Falcon III twin-boom swept-wing fighter powered by a 1,850hp Hispano-Suiza V-12 engine. No 20 Lt. Bo Qvist returns for Denmark and is flying a red production DAF(s)4v3 Falcon III fighter. No 21 Capt. José María Bravo Fernandez-Hermosa, senior instructor at the Ejército del Aire's Advanced Air Combat School returns yet again flying a red Focke Wulf Fw-190 A-1 fighter powered by a BMW-801 radial engine. No 22 Capt. Fernando Sanchez-Arjona Courtoy, senior test pilot at the Ejército del Aire's flight testing squadron returns for Iberia flying a camouflaged Focke Wulf Fw-190 A-1 fighter. No 23 Enseigne de vaisseau de première classe Roger Sauvage, a black West Indian (Martinique) pilot is France’s latest new pilot to fly at Talons. Sauvage has attended the FAR Aerial Warfare School in Limoges and graduated fifth in the Class of 1940 and then was assigned to Flotille 32F to assist their transition to the new M.B.1050 and he has logged more flight hours in the Milan than any other pilot aside from Bloch's chief test pilot. He is flying a standard Bloch M.B.1050 Milan fighter. No 24 Capitaine Edmond Marin La Meslee returns to Talons for the second time, he was recently promoted to the command of Escadron de chasse 01.002 "Cigognes" and is flying a standard Arsenal VG.60 Revenant fighter powered by a Hispano-Suiza 12Z V-12 engine. No 25 Comandante de Escuadrilla Carlos Matta, commander of 110 Escuadrón, 3rd Fighter Regiment, makes his third Talons appearance, his ENAER-built I-02 Pulqui fighter is named "Laura Fiora II" for his wife and is painted in the stock-standard Chilean desert camouflage. No 26 Capitan de Corbeta (Lt. Com.) Patricio Mistral makes his fourth Talons appearance. He has now served for two years as an instructor at the FAR Aerial Warfare School in Limoges and this year he is flying the new Chilean-built ENAER F4E-2 Corsair fighter. No 27 Flt. Capt. Bertus Brase is a newcomer representing the SAE. He is the squadron leader of No. 210 Squadron, during the war in South America where he was credited with six confirmed victories. He is flying a production radial-engined Walter F-11C Falcon fighter named "Slightly Dangerous" and painted in green and light grey. No 28 Flt. Capt. Emil Trubshaw is another newcomer for the SAE. He is squadron leader of No. 78 Squadron in Buenos Aires and started his career flying the A-18 Havik light bomber during the early stages of the South American war before he became a fighter pilot and achieved two confirmed kills in air-to-air combat. He is flying his personal JFM F-12D Sparrow "Shady Lady" newly painted with a white forward fuselage, red tail aft of her cockpit section and a fine nose art on her cowling. No 29 Colonel Fabris "Jester" Lavidicus, the commander of the Atlantean Air Force adversary training squadron, returns again to represent Atlantis and he is flying the sixty-eighth production Spartan SP-35 "Viper" in an all-over red scheme. No 30 Lt. Colonel Tyrus "Bulldog" Hadrian also again returns to Talons, this year he is flying the tenth production Spartan Sp-40A “Spirit II” fighter, a Spartan-built I-02-11 Pulqui powered by a 1,500hp Spartan V-12 engine and painted red overall. No 31 Yarbay (Lieutenant Colonel, squadron commander) Sabiha Gökçen returns to Talons representing Turkey and is flying the twelfth Heinkel He-100 B-6 fighter to be delivered to Turkey painted in a fetching red and black scheme. 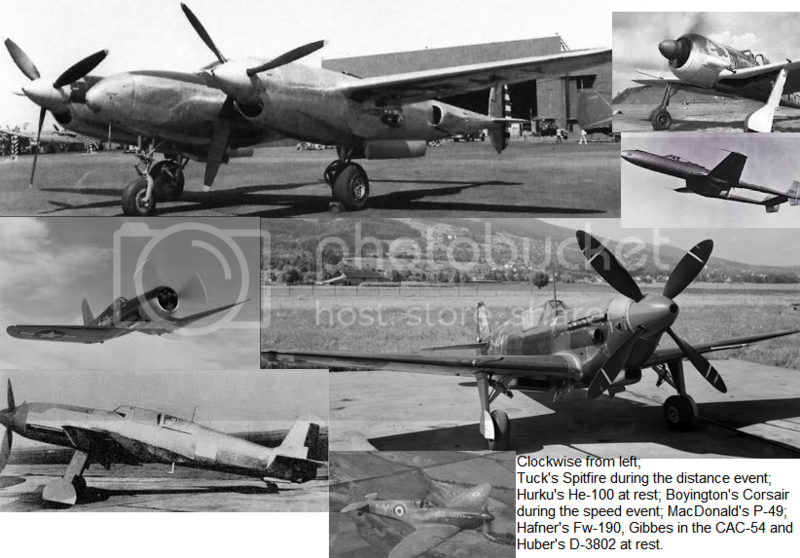 No 32 Vecihi Hürku also returns again representing Turkey and is flying the twenty-ninth Heinkel He-100 B-6 fighter to be delivered to Turkey in natural metal finish. No 33 Major Henry Pillichody, representing Colombia again this year, is flying a production Spartan Sp-35 Viper pained in the national colours. No 34 Teniente Delfín Torres Duran also returns to represent Colombia this year and is flying his usual black Ripon-Bloch RB.132 "Renegade II" fighter. No 36 Flight Lieutenant Nurettin Tural after a break returns to Talons to represent Byzantium and he is also flying a Spartan Sp-40 “Spirit” fighter in standard camouflage. No 37 Episminagos (Squadron Leader) Ionnis Leventis represents Greece for the second time for Greece. Leventis is leader of 4 Sqn based in Tanagra and is again flying a Boulton Paul P.94 powered by a Rolls-Royce Merlin V-12 engine. No 38 Capitano Barton from the Scuola Bergamini in Italy makes his Talons debut in a production Fiat Centauro Serie III which is the latest production type. The performance is similar to the previous Serie II but the agility at high speeds is markedly improved by the introduction of spring-tab ailerons and a revision to the power-assisted elevator. No 39 Capitano Sacconi is another Scuola Bergamini graduate and he is also making a debut at Talons and is flying an identical Fiat Centauro Serie III. No 40 Second Lieut. Charles H. MacDonald, USAAF, makes his debut for the United States flying a Lockheed P-49 twin-engined fighter. No 41 Second Lieut Gregory Boyington, US Marine Corps, is another newcomer to Talons and he is flying an F4U FG-1. No 42 Group Captain Otto Larsen returns to Talons from his desk job to represent Nordmark again and is flying his favourite mount, a specially painted yellow and blue SAAB F-21 Mk 1 pusher-engined fighter. No 43 Lieutenant Ilmari Juutilainen, a young and promising pilot makes his third appearance at Talons for Nordmark flying a camouflaged SAAB F-21 Mk 1 pusher-engined fighter. No 46 Capitan Maurice Huber returns to represent Switzerland this flying the sixth production example of the brand-new EKW D-3802 fighter with a 1,250hp Saurer YS-2 V-12 engine and painted in a fetching red and white scheme Swiss flag scheme. No 48 Kapitán Karel Kuttelwascher is representing Czechoslovakia for the third time this year flying the twenty-eighth production Fokker-Avia B-139 fighter powered by a 1,450hp Minerva-Avia 105 V-12 inline engine. The groups are arranged according to engine horsepower to make the events closer and to give the lower-end fighters a chance to shine. Excellent, two Italians vs. two Mexicans; I can see that being fun, especially with the almost 100km/h speed advantage and large climb rate advantage of the Centauro. A perfect opportunity to use the energy tactics formulated over the last few years, and then combined with the spring tab ailerons to make manoeuvering at high speed a lot easier as well. A general note on the Scuola Bergamini. It's not really like the Top Gun clones elsewhere in WW with "graduates". It's much more like the RAF Qualified Weapons Instructor QWI courses, with extensive learning on how best to fight the aircraft and then how to teach this knowledge. The aim is to produce good instructors who then rotate back into normal squadrons and improve all pilots to "good", rather than simply make some good pilots a bit better. The 100km consists of four laps of a roughly square 25km circuit with four corners. This event this calls for great speed and momentum management skills and the ability to fly fast in a close group without mishap. Overtaking in the corners has been banned as too hazardous and overtaking must be done during the straights of the course. The six contenders in the first event were; USAAF Second Lieut. Charles H. MacDonald in the Lockheed P-49, Captain Robert (Bobby) Gibbes in the CAC-54, RCNAS Captain Reginald Antilles in the Burnelli CF-38b, the two Brazilians Comandante Gaspar Alencar and Capitão Manoel Santos in their BL-01 Tufão/Bloch Milan fighters and Enseigne Roger Sauvage flying a third Bloch Milan. The P-49 and the CF-38b were both twin-engined fighters. The punters favourite to win was Antilles based on past performance but the sizable Brazilian crowd were supporting their home talent to take the victory. The race began with a rolling start (all six planes wings level at 250mph) and four laps of 25km were undertaken. The CF-38b had the better acceleration but the P-49 was not far behind, the three Milans were very closely matched but Sauvage with his superior knowledge of the type’s capabilities was edging ahead of the Brazilians. During the second lap Gibbes in the CAC-54 was building up momentum and made some good turns to enable himself to overtake MacDonald. Gibbes found himself under pressure from the Milans. Up front during the third lap Antilles was making headway with Sauvage close behind, Santos then Gibbes. Alencar briefly lost his position to MacDonald but during the third lap eased past down the straight, meanwhile up front Sauvage attempted to pass the Canadian but failed. Alencar on the final lap nipped past Santos on the second straight, Gibbes attempted the same but found himself closed out as the pylon loomed ahead. On the next straight he found the P-49 directly astern and slightly above him but he pressed on and nearly passed Santos but he lacked the power to overhaul the rugged radial-engined Milan. Antilles using his size managed to squeeze out Sauvage to take first place, Sauvage came second, Alencar third, Santos fourth, Gibbes fifth and MacDonald sixth. The next group to compete consisted of; Porucik Lidiya Ivanova in her Fairey Firefly, Capitan de Corbeta Patricio Mistral in the ENAER-built F4E-2 Corsair, Flt. Capt. Bertus Brase in the Walter F-11C Falcon, the two Danes Capt. Andreas Schrieber and Lt. Bo Qvist in their DAF(s)4v2 Falcon III fighters and USMC Second Lieut Gregory Boyington in another F-4U-1 Corsair. The bets were on local pilot Mistral to take the win but the Danish pilots had looked dangerous in the warm-ups the previous day. From the rolling start Brase in the F-11C had the acceleration to pull away from the pack and make himself a safe lead at least for the first two straights. The two Danish Falcons were in hot pursuit with Ivanova overtaking Qvist on the final straight of the first lap. The two Corsairs were an interesting match, the ‘original’ US-built F-4U-1 having 150hp less than the Chilean-built F4E-2 but being generally lighter. Boyington seemed to gain speed the quickest out of the two but by the second lap the greater speed of the Chilean Corsair was edging a lead and Mistral was able to keep the American on the back foot down the straights and Boyington was unable to make his turning advantage count due to the Chilean pilot’s lead. On the second lap Mistral eventually got past Ivanova after two failed attempts while on the second straight Schrieber had dived down and zoomed under Brase to take the lead. Before Brase could counter-attack on the next straight Qvist almost passed too but Brase side-slipped ahead of him and Qvist had to break-off. This allowed Mistral to get into third place. Qvist had he pace to take third back from the Chilean on the final straight of the third lap. Boyington and Ivanova seemed to be enjoying a tussle to decide who would avoid the ignominy of coming last, both pilots swapping positions on almost every straight. Both of the bulky naval fighters were sluggish but both were proving quite agile. Up front on the second straight of the final lap Brase thought he was near enough to get past Schreiber just ahead of him. Suddenly his F-11C shudders and then smoke and flames come pouring out of the port-side of his cowling. As if hit by a brick wall his plane rapidly decelerated, Brase chopped his throttle and carefully swung clear of the course to avoid a collision. He rapidly assessed the situation and made for the boundary of the airfield keeping a course that kept the smoke on the portside giving him a clear view to starboard so he could choose a landing spot. A cowling panel came away allowing oil and flames to spray over the fuselage past the canopy. Knowing he wouldn’t make the runway he made a dead-stick landing, just passing over the boundary fence to touch down on the grass. He leapt from the cockpit but within a minute the skilled fire crews had the minor fire doused. The remaining fighters avoided the smoke and debris and completed the lap without further mishap. The final result was; Schreiber first, Qvist second, Mistral was third (his final passing attempt having failed down the final straight), Boyington fourth and Ivanova fifth. After the ground crews had a chance to recover the F-11C Falcon they diagnosed the problem as overheating and a faulty cylinder head, probably down to a design fault. The planes cowling plates were damaged, the engine wrecked and part of the forward fuselage and equipment burned and spilled with oil. The SAE ground crew within an hour was already preparing the spare engine and were beginning to strip the forward fuselage to begin replacement of items. The chief mechanic told the waiting reporters that they could make "Slightly Dangerous" fly again within four days, the ground crew however, made bets they could do it in less than three. The contenders in this race were; the two Mexicans Rear Admiral Carlos Castillo Breton and First Lieutenant Joachim Edid in the two all-black C-2 Centellas (Mitsubishi J2M2 Raiden) fighters, the Italians Capitano Barton and Capitano Sacconi in the FIAT G.55s, Captain Peters in the radical tandem-wing CAC-39 twin-engined fighter and RCNAS Commander Mark Stele in the equally radical Avro Canada CF-12. The punters backed one of the Italians to win, the G.55 seeming unstoppable in previous years. At the rolling start Stele had the better run down the straight but soon found himself with a Mitsubishi on either side of him. By the end of the first lap he was maintaining a slight lead and the two Mexicans had the distraction of the two Italians bearing down on them. The second lap was largely the same running order, Peters had failed to keep the Italians behind him but Edid was still within reach. On the third lap Breton seemed to coax extra horsepower from his engine to leap ahead of the Canadian on the first straight and by the second straight Barton was pressing him hard. Sacconi got past Edid and indeed Peters on the final straight almost passed the Raiden too. Stele easily kept Sacconi behind but Barton slipped down the other side. Peters passed Edid but there was no denying that his fighter lacked the outright pace to keep enough of a lead. Edid attempted to pass Stele on the second straight of the final lap but failed to get past and Sacconi failed on the next straight despite his superior power and speed. Barton was challenging for first place but Breton just managed to hold onto first by a half a cowling. Barton took the second place, Stele third, Sacconi fourth, Edid managed to get past Peters to claim fifth and Peters was sixth. This race comprised the following pilots and aircraft; Major Amnuay Jainukul, Oberleutnant Heinrich Bär, Stabsfeldwebel Anton Hafner, Capt. José Fernandez-Hermosa and Capt. Sanchez-Arjona Courtoy were all flying Focke Wulf Fw-190A fighters and Capitaine Edmond Marin La Meslee was flying the Arsenal VG.60 Revenant. In this “Focke Wulf Group” as the commentator called it the Frenchman La Meslee was the favoured winner, the VG.60 showing far greater speed potential than the Fw-190. Courtoy had a slight lead at the start but La Meslee soon swept past and he found himself under pressure from Hafner and Bär. The Iberian Fw-190s have less powerful BMW 801C radials and were overall slightly slower over the straight line and slower in acceleration. La Meslee by the second lap was making a slight lead. The two Germans were behind with Courtoy close behind. Fernandez-Hermosa easily got past Jainukul. Courtoy passed Hafner on the third straight of the second lap, Bär having already passed his teammate. Jainukul attempted to pass Fernandez-Hermosa but failed to execute the pass. During the third lap Courtoy lost his place to Hafner again, Bär had failed to catch La Meslee and Fernandez-Hermosa was pushing Courtoy hard. On the final lap Hafner slipped past his teammate on the first straight and on the next Fernandez-Hermosa just nipped in ahead of Courtoy before the turn. Jainukul was pressing hard and by the final straight of the lap had just managed to get alongside and slightly ahead of the Iberian. The finishing places were; La Meslee took first with a seemingly effortless run, Hafner was second, Bär third, Fernandez-Hermosa fourth, Jainukul fifth and Courtoy sixth. Great to see Talons is firing up. Cross my fingers for good luck for Episminagos Leventis. Nice match ups so far! Great movie where is the popcorn ??? The French won a Race Group event!? The French won a Race Group event!? And the second French plane won second in a different race group? And the French-built Brazilian planes placed third and fourth in the same race? And the Chilean Corsair placed third in their race? That's... unusually good luck. It must mean I've either sent comparable planes this year, or things are about to go horribly wrong for me. Shhhhh...dont jinx it. That means things would go wrong for me to. Eh, probably not for you. As we saw last year with the Fw190, foreign purchasers never have any difficulties with their aircraft even when the manufacturing country has problems. So you should be safe. Oh, thank you for reminding me of that. Now I'm jinxed. The race was contested by the following pilots and aircraft; Flt. Capt. Emil Trubshaw in the JFD F-12D Sparrow, Colonel Fabris "Jester" Lavidicus and Major Henry Pillichody were flying the two Spartan Sp-35 Vipers, Major de Aero Cisco in the FMA I-02-II, Lt. Colonel Tyrus "Bulldog" Hadrian in the identical Spartan Sp-40A Spirit-II and Group Captain Otto Larsen in the SAAB F-21 Mk1. The home crowds were willing Cisco to victory. Four of the planes in this event had identical engines but the fighters were different. The Sp-35 and the I-02-II/ Sp-40 were different in design and conception but shared the same engine and were of different performance. The I-02-II had a slight edge over the Viper in the acceleration and straight-line performance. In the corners the Vipers lost less speed and remained competitive. By the second lap Cisco was leading with "Bulldog" Hadrian close behind, "Jester" Lavidicus was right behind his Atlantean teammate pressing very hard and looking dangerous after the turn. Trubshaw in the F-12D was behind the Atlantean after powering past Pillichody, he was proving that the F-12D was an equal to the Viper in every respect. Larsen was slow to get started and seemed to be lagging behind the other fighters and although his lap times were competitive by the third lap he could not make good the lead by the other fighters. The third lap saw "Bulldog" Hadrian take the lead, Trubshaw eventually got past "Jester" Lavidicus and on the final straight of the lap Pillichody too nearly edged his Viper past the Atlantean. On the final lap down the second straight Cisco dived beneath "Bulldog" Hadrian and retook the lead and held onto his slender lead until the finish, both finishing nearly side-by-side. Trubshaw found himself at the limits of what his fighter could do and coming out of the final corner a slight error of judgement just cost him enough speed to allow "Jester" Lavidicus to slowly edge past and both fly over the finish line abreast each other. The final rankings were; Cisco first, "Bulldog" Hadrian second, "Jester" Lavidicus third, Trubshaw fourth, Pillichody fifth and Larsen sixth. The sixth race comprised; Lieutenant Ilmari Juutilainen in his SAAB F-21, Kapitán Karel Kuttelwascher in the Avia B-139, the two Turks Yarbay Sabiha Gökçen and Vecihi Hürku in the Heinkel He-100 fighters, Major de Aero Valdez in his FMA I-02 and Comandante Carlos Matta in an identical Chilean-built I-02, the ENAER F2E.The punters favoured their home favourite Major de Aero Valdez to win but those in the know put their money on one of the better equipped Turkish duo to win. From the rolling start the Avia B-139 held its own against the two Heinkels and indeed for the first lap Kuttelwascher was able to hold his own. Valdez was close behind but Matta found himself under the aggressive passing manoeuvres of Juutilainen and as the second lap started the young Nord got past. Hürku was first to tackle the Czech and despite his side-slip the Turk eased the stick over and slid over and passed on the opposite side. After the next turn the He-100 was too far away to attempt a pass and instead Gökçen’s propeller was ominously whirring in Kuttelwascher’s right ear. As they came out of the next turn Valdez decided to make a break for it and rammed his throttle past the gate and dived to gain speed, he got past one of the planes but in the next turn fell back a little. Matta on the next straight powered past Juutilainen but the Nord nearly regained his position at the next pylon. Under pressure eventually Gökçen got past Kuttelwascher and Valdez was close enough to make an attempt to pass. In fact it was Matta that on the next straight leapfrogged both pilots in a sustained high-speed dash. He had probably over-stressed the engine on maximum boost but he had just enough time to cut the engine back to a safer rpm and pass both pilots in the process. It was a gamble that had paid off. Indeed on the final lap Juutilainen nearly got the better of Valdez and the Argentine played his throttle and boost setting well to get the most from the engine when he needed it. Hürku finished first with a comfortable margin, Gökçen was second, Matta hung on to claim third, Kuttelwascher narrowly claimed fourth, Valdez was fifth and Juutilainen was, perhaps unjustifiably given his aggressive intent to pass, sixth. This group was composed of; Captain Kenan Sunay and Flight Lieutenant Nurettin Tural flying two Sp-40 Spirit (I-02) fighters, Episminagos Ionnis Leventis in the Boulton Paul P.94, the two Swiss pilots Capitan Maurice Huber and Lt. Marcel Gehrig in the new EKW D-3802s and Captain Mihailo Bodi in a Soko Jastreb. Lenventis in the P.94 had given the Swiss a hard time during the first lap and only in the final straight of the second lap did Huber get past followed by Gehrig two straights later. Sunay by this time was in the lead but the group was still tightly bunched. During the second straight run of the third lap Huber had gotten past Tural, Bodi was in a see-saw swap of places with Leventis and Gehrig seemed to have the measure of both pilots. Sunay was holding onto his slender lead but Tural on the first straight of the final lap managed to power past the D-3802, Gehrig was not far behind. Bodi passed Leventis too during that straight run, on the next Leventis made the Merlin scream as he poured on the power and just edged past. Huber briefly tasted second place again but lost it down the final straight and Gehrig lacked the time to ease his nose past Tural’s Sp-40. The final rankings were; Sunay first, Tural second, Gehrig third, Huber (just by a fraction) was fourth, Leventis fifth and Bodi sixth. The final group was made up of the following pilots and aircraft; Lieutenant Djorde Popovic in a Soko Jastreb, Teniente Delfín Torres Duran in the Ripon-Bloch RB.132 Renegade II, the two British pilots Flt. Lt. Bob Stanford Tuck and Flt. Lt. Jonnie Johnson and Bulgarian Kapitan Dobri Kolarov all flying roughly identical Supermarine Spitfire Mk IIIs and Captain Kamal Arthrit in the Reggiane Re-2001. The punters had a hard time choosing a winner and the bets largely went on Stanford Tuck. The Spitfires totally dominated the race, although lacking the horsepower of the Jastreb and Renegade both were stubby radial-engined fighters and although both Duran and Popovic made good starts the Spitfires were unstoppable by the second lap. Arthrit managed to hold onto fourth place for two laps but found himself struggling to keep Duran behind him and eventually the Colombian passed. Of the front-runners Johnson took the lead on the second lap, by the end of the lap Kolarov was able to ease past Tuck. Tuck waited until the next straight and after a good fast turn managed to overtake the Bulgarian. During the final lap Tuck managed to just get enough of a lead on Johnson to take first, Johnson was second, Kolarov third, Popovic fourth, Duran fifth and Arthrit sixth. The winners of all eight races face each other in the Grand Final. The pilots and aircraft in the final were; Vecihi Hürku in the He-100, Captain Antilles in the CF-38b, Major de Aero Cisco in the FMA I-02-II, Capt. Schrieber in the DAF Falcon, Capitaine La Meslee in the VG.60, Captain Sunay in the Sp-40, Rear Admiral Breton in the C-2 Raiden and Flt. Lt. Stanford Tuck in the Spitfire III. On paper 113 km/h and 700hp separated the contenders but of course during these high-speed races the playing field was more level than paper figures would suggest. Antilles in the CF-38b was the sole twin-engined fighter. Those taking a flutter on the winner were torn between who to place their money on. The home crowd of course favoured Cisco but would the new I-02-II have the power to beat the other strong contenders? The noise of nine aero engines at full throttle at the start was indescribable. The fighters jockeyed for position and several pilots found themselves squeezed out at the first turn. The group was bunched and the big CF-38b made a flying obstacle for some of the pilots which they had to get around. Generally the VG.60 Revenant, CF-38b, and He-100 seemed to have the pace to sustain some kind of lead as the race went into the second lap. Breton and Tuck were making up the rear of the pack, both fighters being evenly matched on the level and perhaps the Spitfire making the most progress but certainly Breton’s skill was evident. Cisco and Schreiber in the mid-field (as small as it was) were having a private duel, the I-02-II though was getting the better of the Falcon but the margins were tight. La Meslee fell behind Hürku but Antilles was in no position to attack for second place. His big fighter was certainly quick but not agile enough to match the sleek VG.60. Sunay was proving that the original I-02 was just as good as the second-generation and he saw off any attempt by Breton to pass and indeed Sunay during the final lap powered past Schreiber. Cisco on the final lap made an engine-howling fast run which just nudged Antilles aside. The photo-finish was dramatic, as the whole race had been and the final podium positions were; Hürku first (reprising last year’s result), La Meslee second, Cisco third, Antilles fourth, Sunay fifth, Schreiber sixth, Tuck seventh and Breton being neck-and-neck with the British pilot came eighth. The French beat the Mexicans! Life is good. Careful, Brock. They might demand a rematch. Only first gets you into the grand duel anyway so Atlantis and Colombia share the sentiment.. The Turks on the other hand are quite pleased! This year the new much longer flight was retained. The route was course from Cordoba Air Base to San Juan and back to Cordoba. The final course was only given to the pilots five minutes before take-off to test their navigation skills. The total length of the course was 800km. The planes were to land at San Juan for refuelling. At the half-way pint of each leg there is a judges station which the pilots must circle and radio in their call sign. If a pilot fails to locate and/or fails to radio his call sign to the judges below, then half of any points scored (if any) will be deducted. If a pilot misses both judges’ posts then no points are scored. No aircraft can fly over 20,000 feet along the course but the choice of height below that is left to the pilots’ discretion with 1,000 feet as the absolute minimum. Over mountainous areas the height is 15,000 feet for all aircraft. All aircraft took off at one minute intervals from 07:00 and were timed from take-off to landing at Bahia Blanca. The planes refuelled at Bahia Blanca and returned to Cordoba after the event. This year the weather less than ideal with bands of rain near San Juan and gusty wind conditions, especially over the San Cordoba mountain range west of the city. Here are the rankings in order after all the times were in after the course was completed and verification had come from the mid-way judges posts. Captain Reginald Antilles was first in the CF-38b having made a perfect flight. The two Turkish pilots thanks to their fast Heinkel fighters managed to claim second, Yarbay Gökçen, and third, Vecihi Hürku, respectively. Hürku though missed the judges post due to thick weather and scored only have points. The Chilean Capitan de Corbeta Mistral made great use of his naval training and his dead reckoning navigation in the heavy rain near San Juan made sure he made a perfect homeward leg to claim fourth. Major de Aero Cisco, knows all the areas like the back of his hand and he managed to claim fifth. The Brazilian Capitão Manoel Santos in his Milan was only three seconds behind Cisco. Major de Aero Valdez, the other Argentine pilot, was also able to use his local knowledge to good effect to claim seventh. Eighth went to Lt. Colonel "Bulldog" Hadrian in the Sp-40A and he too has previous knowledge of the area from previous events. The Frenchman Enseigne Roger Sauvage made a smooth run and he too managed to plot an accurate course when the weather closed in to claim ninth. Captain Schreiber posted an almost identical time to claim the last points position. Comandante Matta just missed out on a points place. The other Dane, Lt. Bo Qvist had supercharger trouble over the mountains but managed to regain some time. The two newcomers from Italy, Capitano Barton and Capitano Sacconi flew side-by-side in the event and they did not get lost and posted a good time. Major Henry Pillichody was next and had a smooth run, unlike Colonel "Jester" Lavidicus who suffered from headwinds costing him fuel, canopy misting and his bottle of orange juice exploded over the San Cordoba mountain range smearing his windscreen. He eventually got it cleared but it cost him time. Captain Kenan Sunay and Flt. Capt. Emil Trubshaw posted identical times. Flight Lieutenant Tural missed the outbound judges post but made a good run. Second Lieut. MacDonald in the P-49 had a smooth and accurate flight over the mountains but he nearly came to grief when landing on the tight strip at San Juan. He got off ok and made an excellent run back. Capitaine Edmond Marin La Meslee was next followed by Group Captain Otto Larsen who wasn’t worried about the thicker weather given his Northern navigation training. Stabsfeldwebel Anton Hafner in his Fw190 flew well and was followed most of the way by the Australian Captain ‘Bobby’ Gibbes. Lieutenant Ilmari Juutilainen in the other SAAB F-21 fly very well but lacked the pace to get further up the scoreboard. Commander Mark Stele outpaced Capitan Maurice Huber in his D-3802. The Thai pilot got lost Major Amnuay Jainukul more than once and missed both judges posts. Kapitán Kuttelwascher was next followed by Second Lt. Boyington in his Corsair. He was delayed when he suffered from propeller pitch problems. Lt. Marcel Gehrig made a nice run with no errors. Capt. Fernandez-Hermosa also had a good run, especially over the mountains and Capt. Sanchez-Arjona Courtoy was close behind him. Porucik Lidiya Ivanova was glad of her sturdy Fairey Firefly when she made a heavy landing at San Juan. She set a homeward course by following the roads for the first 40km. Rear Admiral Carlos Castillo Breton flew well but his Raiden lacked the power to post a good enough time for any points. Kapitan Dobri Kolarov did well in his Spitfire. Captain Peters was next in the CAC-39 and he even flew an impromptu aerobatics display over San Juan. First Lieutenant Edid was suffering with compass error but he managed to correct it and land at San Juan but he missed the judges station. Flt. Lt. Bob Stanford Tuck posted a time just two seconds less than Edid. Episminagos Leventis, Captain Bodi and Teniente Duran flew as a gaggle over the mountains and took the course quite low and were all within twenty seconds of each other. Captain Kamal Arthrit posted the longest time but had a good run all the way. Oberleutnant Heinrich Bär failed to complete the course; rising oil temperature forced him to return to Cordoba after only thirty minutes. Lieutenant Popovic got totally lost over the mountains and found himself in a thick bank of cloud. He got disorientated and fell into a spin but recovered, thankfully over lower ground, he continued but his compass had tumbled and he eventually landed in a field some 30km from San Juan low on fuel. After the locals obtained some fuel for him he set off for San Juan but fuel contamination forced him to sit out the rest of the event. He would not fly back to Cordoba until the following afternoon. Flt. Lt. Jonnie Johnson in the other RAF Spitfire suffered a bird-strike shortly after take-off which smashed his windscreen. He returned and made a safe landing. Comandante Alencar was having an excellent outbound flight but he misjudged his landing at San Juan and made a heavy landing. He bounced twice and ran off the end of the runway. No serious damage was caused but his port undercarriage was damaged and the tyre spilt. He too returned to Cordoba the next day with Lieutenant Popovic. Each pilot was timed along a ten mile straight course during which the aircraft attempted a top speed run after a shallow dive run-in to build up speed. The run was done at 15,000 feet to equalise the chances given the variety of aircraft and engines. Here are the speeds reached from fastest to lowest; Gökçen in the He-100 B-6 recorded this year’s best speed of 714.9kmh to claim first place. Antilles in the CF-38b took second with a speed of 714.1kmh with Hürku close behind at 713.9kmh in third place. Sauvage was fourth with a speed of 683.5kmh in the M.B.1050 Milan, Sacconi was fifth in the G.55 with 683.4kmh. Alencar was sixth in his Mistral with a speed of 682.6kmh, Barton in the second G.55 recorded 682.4kmh and Santos in the third Mistral was eighth with a speed of 681.5kmh. Ninth place went to Cisco in the FMA I-02-II with a speed of 679.6kmh and tenth went to "Bulldog" Hadrian in the Sp-40A with a speed of 679.3kmh. The rest of the pilots missed out on points but the order was; Qvist 676kmh, Schreiber 674.8kmh, Mistral 669.7kmh, "Jester" Lavidicus 669.2kmh, MacDonald 669.1kmh, Pillichody 668.3kmh, La Meslee 668.1kmh, Valdez 665.8mkh, Trubshaw 665.6kmh, Matta 665.2kmh, Sunay 664.5kmh, Tural 663.2kmh, Brase 661.1kmh, Hafner 651.8kmh, Bär 648.8kmh, Gibbes 646.2kmh, Stele 642kmh, Jainukul 641.9kmh, Larsen 640.9kmh, Juutilainen 639.6kmh, Huber 631.3kmh, Boyington 630.1kmh, Gehrig 629.7kmh, Kuttelwascher 624.5kmh, Courtoy 619.5kmh, Fernandez-Hermosa 617.9kmh, Ivanova 613.6kmh, Johnson 601.4kmh, Stanford Tuck, 600.9kmh, Kolarov, 600.7kmh, Breton 696.1kmh, Edid 696kmh, Peters 579.1kmh, Leventis 578.9kmh, Popovic 574.4kmh, Bodi 573.2kmh, Duran 550.2kmh and lastly Arthrit with 526.4kmh. Compared with last year the highest speed achieved was 1.2kmh slower but the He-100 and CF-38b maintained their claim to be the fastest fighters in the world. The slowest speed this year was 10kmh faster. All the pilots completed the event. Compared to the first time this event was held in 1932 the fastest speed was 520kmh by a Nakajima Ki-12 and the slowest speed was 293kmh recorded by a Nakajima A2N. This trial was a timed mock interception. The pilot was timed from ‘Contact’, taxiing, take-off and a climb to 3000m or as high as the aircraft can reach to this figure. The fastest to slowest pilots this year were; Barton scored the top points with a rate of climb of 20.9m per second proving the Centuaro’s dominance again this year, his teammate Sacconi took second with a rate of climb of 20.4m per second. Antilles was third with a rate of climb of 19.3m per second, Brase was fourth with 18.4m per second, La Meslee was fifth with an almost identical time working out at 18.3m per second. Sixth and seventh went to Edid and Breton with a rate of climb of 17.7m and 17.5m per second respectively. Hafner was eighth with 17.4m per second, Bär achieved 17.3m per second to claim ninth and the final points place went to Jainukul who achieved a rate of climb of 17.1m per second. The rest of the pilots recorded the following; Fernandez-Hermosa 17m per second, MacDonald 16.8m per second, Courtoy 16.7m per second, Kuttelwascher 16.5m per second and Johnson also tied this figure. Gökçen, Kolarov, Stanford Tuck and Leventis all claimed 16.4m per second, Hürku was just behind with 16.3m per second, Trubshaw recorded 16m per second, Sauvage achieved 15.9m per second, Alencar 15.8m per second, Stele 15.6m per second, Santos and Cisco both recorded 15.5m per second, "Bulldog" Hadrian 15.3m per second, Schreiber 15.2m per second, Juutilainen 15.1m per second, Larsen 15m per second, Schreiber 14.9m per second, Boyington 14.6m per second, Mistral 14.5m per second, "Jester" Lavidicus recorded 13.9m per second, Pillichody 13.7m per second, Huber 13.5m per second, Gehrig recorded 13.3m per second, Matta claimed 13.1m per second and both Valdez and Sunay tied on 13m per second while Tural recorded a climb of 12.8m per second. Arthrit was next with a climb of 12.5m per second, Gibbes recorded 12.1m per second, Duran 11.8m per second, Ivanova 10.1m per second, Bodi 8.3m per second, Popovic 8.1m per second and Peters 7.9m per second. Did Brase miss the navigation run? Or have I overlooked him?